Balin was a Dwarven leader, the son of Fundin and elder brother of Dwalin. He was one of the Dwarves that travelled with Bilbo Baggins and Gandalf to reclaim Erebor. When Bilbo first met Balin, the Dwarf was very old looking with a white beard and a red hood. Balin was born in T.A. 2763, the son of Fundin. When he was seven years old, Smaug invaded the Lonely Mountain. After the Dwarves were driven out at great loss in 2770, Balin and his father Fundin lived with their king Thrór in Dunland. His brother Dwalin was born two years later. Fundin fought in the War of the Dwarves and Orcs, and fell in the Battle of Azanulbizar in 2799. 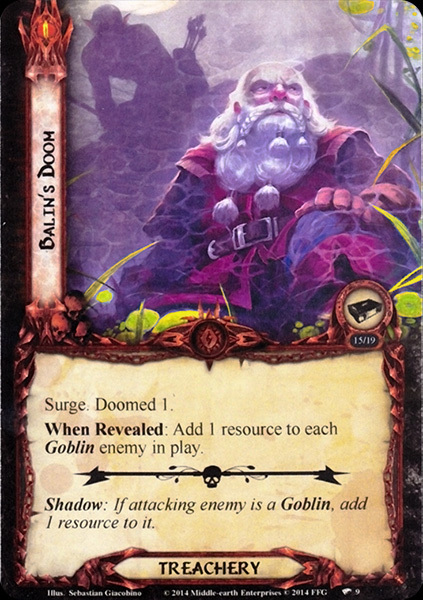 Balin was present at this battle but in what role was remains unknown. [note 1] The Longbeards under Thráin II, including Balin, at first returned to their forges in Dunland, but they moved into Eriador shortly after, and colonized the Blue Mountains. Thráin longed to return to Erebor, and with Balin and Dwalin and a few others in T.A. 2841 he went on an expedition to their ancient hall. Sauron had them in his sights, eager to take the Ring of Thrór from the exiled king. Wolves, orcs and evil birds harassed the small company as they came east. One night, as they had crossed the Anduin, an evil rain forced them into the eaves of Mirkwood, and the company was split. Thráin was never seen again, and Balin and Dwalin returned to the Blue Mountains to report the news to Thorin, the new king of Durin's line. In 2941, during Gandalf's efforts to persuade Thorin to take Bilbo to Erebor (before the party at Bag End), Balin played an important if unintentional role. When Gandalf said that 'professional stealth' was needed Balin misunderstood him as recommending a trained treasure-hunter. As Gandalf defended hobbits in general and the particular hobbit he had in mind, stating that his hobbit had some gold, silver, and crystal, Balin again jumped to the conclusion that Bilbo was an outright thief. In his anger at this remark Gandalf proclaimed that Bilbo had to come or else the enterprise would be a failure, and Thorin then agreed to meet the hobbit. Thus Balin accidentally insured that Bilbo would be part of the quest. On the day of the unexpected party Balin was the second Dwarf to appear at Bag End; his comment, 'they have begun to arrive' flustered the hobbit considerably. Later, when the Dwarves made music, Balin and his brother Dwalin brought in and play viols. On the day after the party Balin stood at the door of the Green Dragon Inn, awaiting Bilbo's arrival. This was the first of many instances where Balin served as the chief look-out for Thorin's company. In fact, it was when Bilbo (wearing the One Ring and thus invisible) sneaked past Balin on look-out duty after their adventures with the Goblins in the mountains that Balin began to develop great respect for the hobbit. Balin and his brother Dwalin tended to act together as a pair. In the clearing of the Wargs Balin and Dwalin were the two who swarmed up a tall slender fir. When the Dwarves arrived at Beorn's hall, the two brothers were the third pair to appear. Thorin did split the two when the crossed the Enchanted River – Balin went in the first boatload with Thorin, Bilbo, and Fíli while Dwalin came last with Bombur. Balin's growing fondness for Bilbo became apparent after the hobbit had rescued the Dwarves from the spiders in Mirkwood. Having seen Bilbo vanish they, especially Balin, wanted the true story of Gollum and the Ring explained. Finally satisfied as to how Bilbo had sneaked past him after the mountains, Balin called the hobbit 'Good old Bilbo'. When the Dwarves were hauled before the Elvenking they did not know that Thorin had been taken before them and put into a cell deep in the king's dungeon. 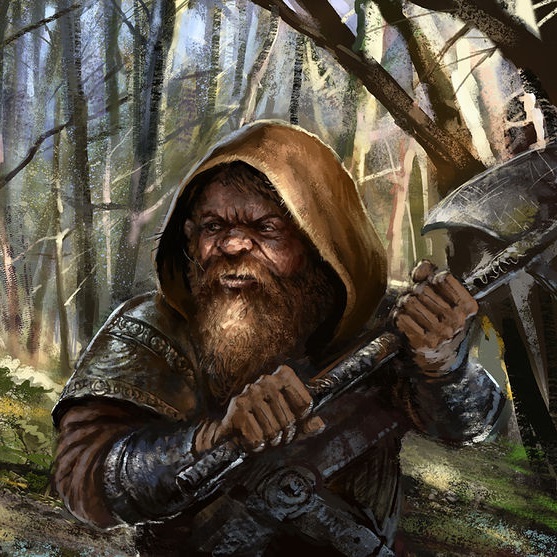 Balin, being the second oldest of the party, became the spokes-dwarf. His angry, surly answers to Thranduil led to their confinement too. Balin and Dwalin were two of the most unhappy Dwarves when unpacked from their barrels before Lake-town and were not asked to help release the others. After leaving the town and as their ponies trudged towards the Mountain, Balin and Bilbo rode together in the rear, leading ponies laden with supplies. That Balin had become the fondest of Bilbo of all the Dwarves was demonstrated when the hobbit made his first descent into the Lonely Mountain. None of the other Dwarves volunteered to accompany Bilbo except for Balin, who did go partway down the passageway. Balin waited there and when Bilbo returned he delightedly carried the tired hobbit back to the door. Later, when Bilbo dropped his torch in Smaug's lair, Balin pointed out that it was the Dwarves turn to help and declared that he was quite willing to go. Upon escaping from Erebor, Balin led the company to Ravenhill. 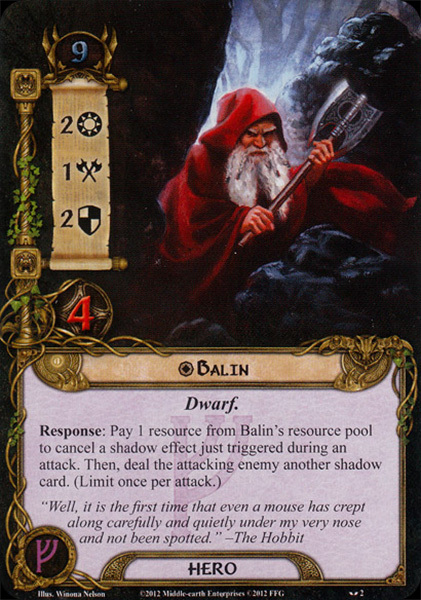 Balin later fought valiantly and survived the Battle of Five Armies. In the autumn of 2949, Balin accompanied Gandalf to visit Bilbo in the Shire. Bilbo noted that Balin's beard was many inches longer and that he wore a magnificent jeweled belt. The three friends talked for hours and Bilbo learned of the new prosperity of the Kingdom under the Mountain and the restored town of Dale. Though the riches of Erebor made the Dwarves prosperous again, there were many who longed to return to Moria. Dáin Ironfoot counseled against it, but Balin mounted an expedition in T.A. 2989. They hoped to regain the treasures, and Balin had also hoped to find the Ring of Thrór, which was assumed to be lost when Thrór entered the Gates years before. Together with Flói, Óin, Ori, Frár, Lóni, Náli and many other Dwarves, Balin entered Dimrill Dale. After a short battle the group entered the Great Gates. They stayed in the Twenty-first Hall, and Balin set up his throne in the Chamber of Mazarbul. He proclaimed himself Lord of Moria. For five years the colony thrived. They managed to find many old treasures, mithril, and armories. But on 10 November T.A. 2994, as Balin went to look in Mirrormere, an orc archer fatally shot him. Balin's body was placed in a tomb in the Chamber of Mazarbul. But the archer was just the van of the orcs who came up the Silverlode. The Dwarves were trapped. After a fierce battle in the halls and a final stand in the Chamber of Mazarbul the colony was completely wiped out. Not knowing what really happened, Glóin and his son Gimli were sent to Rivendell to seek news about the colony. Gimli eventually learned of their fate when he crossed the dwarven realm with the Company of the Ring and found Balin's Tomb. Though most names from the Dwarves in The Hobbit come from the Völuspá, Balin is not one of them. The name rhymes with Dwalin, but has no apparent meaning. Earlier, Balin's beard was yellow instead of white, and his hood was described first as scarlet and then as yellow before red became the final choice. Originally it was Dwalin who spotted the Trolls' fire on the hillside; later this was changed to Balin. When Balin and others scouted the Front Gate at Erebor, in the pre-publication version referred to ravens nearby as 'spies of evil'. In the published story the suspicious birds were changed to crows. In the earliest drafts of The Lord of the Rings, Balin had a son named Burin (or Frár). Burin accompanied Glóin to the Council of Elrond, and became part of the Fellowship of the Ring. The character was changed to Gimli, son of Glóin in the final version.